Apple's in-house mapping service has made the jump to the web some two years after its debut at the company's Worldwide Developers Conference, supplanting Google Maps in the newest preview of the web-based Find my iPhone application. 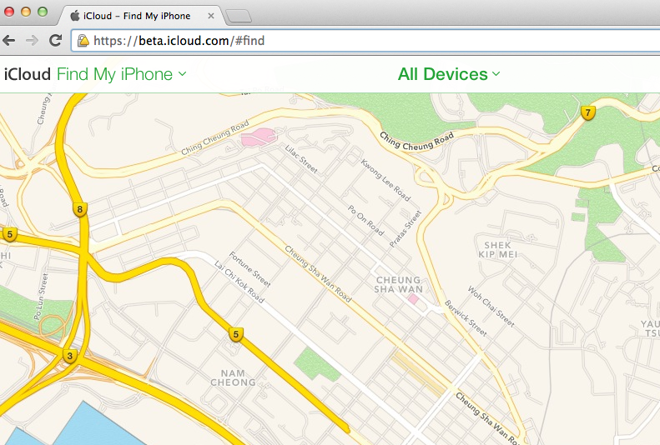 iCloud's Find my iPhone application is one of the few areas where Apple continues to use Google Maps —along with its retail store locator —though Tuesday's unveiling of web-based maps suggests that Google's time is near an end. Apple has been steadily working to improve its own mapping solution in recent months following a nearly disastrous debut that ultimately resulted in the firing of former iOS chief Scott Forstall. The company has begun issuing routine updates to maps and point-of-interest data, with changes propagating at approximately midnight Pacific time every day. Apple has also been seen advertising for new Maps API engineers, hinting at "big plans" to overhaul Maps's backend systems.